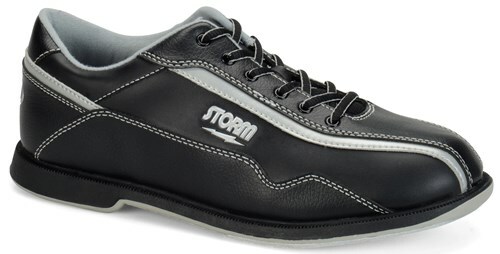 The Storm Volkan bowling shoe is part of Storm's Athletic line of bowling shoes. This universal slide sole shoe has a slight futuristic look. This shoe is value priced and great for any bowler. S8 microfiber slide soles on both feet. Stylish at a very reasonable price. Do these shoe come in wide. I am sorry to say that these shoes do not come in a wide size. If a shoe is a wide shoe it will say so in the title of the shoe. I measure a 10 1/2 in foot size. I wear a normal d/m width. Should size would I be? I wear an 11 in sneakers and a 10 in dress shoes and boots. 3/5/2017 - By Brandon G.
We would always suggest going with the size you wear in sneakers, but we do offer a TrueFit Guarantee for $5.99 that would provide a label for returns and fast exchanges. if I purchase a "closeout" shoe, and it's not the correct size, can it be exchanged for a different size, same model? Hello Tim. Unfortunately, this product is a closeout item and can not be returned or exchanged, for the Storm Mens Volkan are being discontinued and no longer being manufactured and may not have the size that you need in exchange. These are universal soles, for both left and right hand. These are fixed soles. Unfortunately, we do not have a size 15 available in these shoes. Due to the time it takes to produce the Storm Mens Volkan ball it will ship in 2 bus. days. We cannot ship this ball outside the United States.